← Could sudden stratospheric warming bring a cold start to spring? Over parts of the United Arab Emirates and Oman heavy rain and thunderstorms were reported last night and are expected to continue over the coming days. By mid-week, places like Dubai are at risk of seeing very heavy rain, with thunderstorms bringing the threat of hail, strong and gusty winds and possible lifted dust. There is a risk of flash floods with possibly as much as 50-100mm of rain falling in the region over the course of one day. Typically in March as a whole, rainfall totals are around 25mm. This weather will likely bring some disruption to aviation in the area. For the past week or so, the weather in and around the Mediterranean has been very unsettled, with areas of low pressure bringing periods of rain, thunderstorms and strong winds. This theme looks like being maintained this week with parts of southeast Europe expected to see some significant rainfall. An active cold front is currently moving slowly across the region. By the end of the day 180-200mm of rain could fall across some locations in Albania and Montenegro, falling as snow over the highest mountains. The wet weather will progress slowly through southeast Europe over the next 24 hours, bringing the risk of localised flash floods and also some gusty winds in the Aegean Sea. Further rainfall is possible in the area later in the week. In the western Mediterranean, strong, gusty winds and rough seas will pose a hazard to small craft on Tuesday and Thursday this week as the Mistral blows from southern France across the Gulf of Lion. 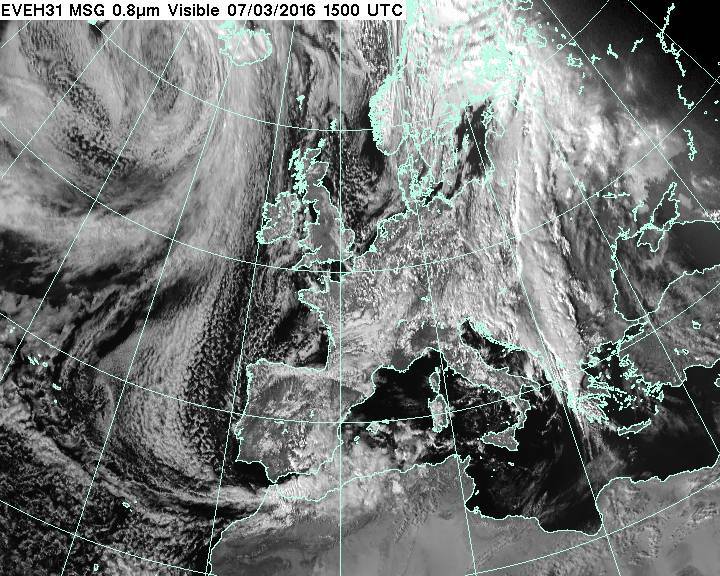 Visible satellite image of Europe at 3pm GMT. Image courtesy of MSG. In eastern parts of Africa this week, heat stress may cause some impacts on health and water supplies as temperatures are expected to be higher than normal. Parts of Eritrea, southeast Egypt and especially Sudan and Ethiopia could see temperatures up to 10C above the average with daytime highs in excess of 40C possible. Across southern parts of Africa the seasonal rains have been enhanced by storm activity with recent flash flooding leading to severe impacts to the population in Angola. This heavy rain and thunderstorms are forecast to shift southeastwards over the coming days, moving into Botswana, southern Mozambique and northern parts of South Africa. Some parts in the east of this area will welcome rain after recent wildfires and drought conditions. This entry was posted in Met Office News and tagged Africa, Europe, flash flooding, heavy rain, middle east, temperature, thunderstorms, world weather. Bookmark the permalink.